Senior Breakfast will take place on Friday, May 17th, from 8:00 am – 9:30 am at Crossings Church. The Breakfast will take place in the upstairs banquet area of the Venue. Tickets are $10.00 and available in the financial office at Santa Fe. Along with a gourmet breakfast that includes traditional breakfast items, fruit, and pastries, there will also be a guest speaker, the Senior Slide Show, and special performances by Santa Fe students. There is limited seating at this event, so hurry and get your tickets today. Graduation Practice is required for all Seniors and will take place at 10:30 am on Friday, May 17th. Practice should end by 12:30 pm and then you will be dismissed for the remainder of the day to spend time with family and prepare for Graduation on Saturday. Graduation Items (including Caps and Gowns) will be delivered to Santa Fe on Wednesday and Thursday, April 3rd and 4th, 2019. If you still owe a balance, please plan to pay the balance to Josten’s at the time of pick up. Seniors who still need a Cap and Gown for Graduation, you may order these items at Jostens.com Please take care of this task as soon as possible in order to insure that you have what you need for graduation, the deadline is April 14th. Graduation will take place at the Cox Event Center on Saturday, May 18th, at 10:00 am. Valedictorians and Salutatorians need to arrive by 8:30 am. Seniors need to arrive by 9:00 am. Meningitis Vaccines for Seniors – Total Wellness will be offering the opportunity for students who are seniors this year to receive the Meningitis vaccine during school hours, at their home high school. Events at all three high schools will take place on FRIDAY, May 3, 2019. 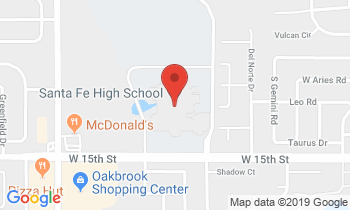 Edmond Santa Fe – 1:30 – 4:00 pm. Participation is optional. Student Authorization Forms will be delivered by Total Wellness to each HS site approximately two weeks prior to the event and will need to be distributed to each senior student to bring back with them on the day of the vaccine.